The Community of Latin American and Caribbean States is the name of a regional bloc of Latin American and Caribbean nations created on February 23, 2010, at the Rio Group-CALC (Cumbre de América Latina y el Caribe, Latin American and Caribbean Summit) Unity Summit held in Playa del Carmen, Quintana Roo, Mexico. It consists 33 sovereign countries in the Americas, and totals roughly 600 million people. Absent of the bloc are: Canada, France, the Netherlands, the United States, British and Danish dependencies in the Americas. CELAC is being created to deepen Latin American integration and to reduce the once overwhelming influence of the United States on the politics and economics of Latin America, and is seen as an alternative to the Organization of American States (OAS), the regional body organized largely by Washington in 1948, ostensibly as a countermeasure to potential Soviet influence in the region. 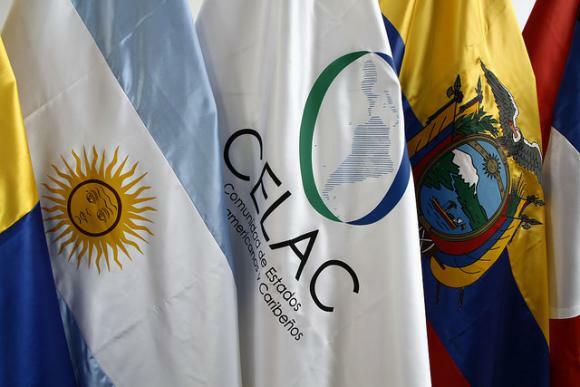 CELAC will be the successor of the merger between the Grupo de Rio (Rio Group) and the CALC (Latin America and the Caribbean Summit). In July 2010, CELAC selected President of Venezuela, socialist Hugo Chávez, and President of Chile, conservative Sebastián Piñera, as co-chairs of the forum that will draft statutes for the organization. For additional information go to: CELAC (temporary official website since a proposed official website should/could have its name together with the file extension ".lat"). 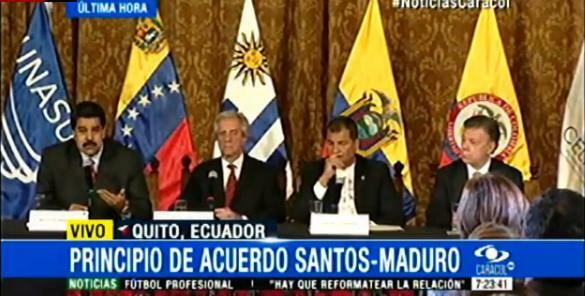 Here's a picture of today from Colombian tv news channel Canal Caracol ( http://www.caracoltv.com/ ), reporting of a meeting from members of CELAC. The flag is the emblem on a white horizontal flag. I found another picture of the CELAC flag. This time, a desktop flag which shows the flag in use as early as 2013 (previously I attached a picture from a 2015 summit, but this time I found an earlier picture). Image shows desktop flag in front of Venezuelan President Nicolás Maduro). 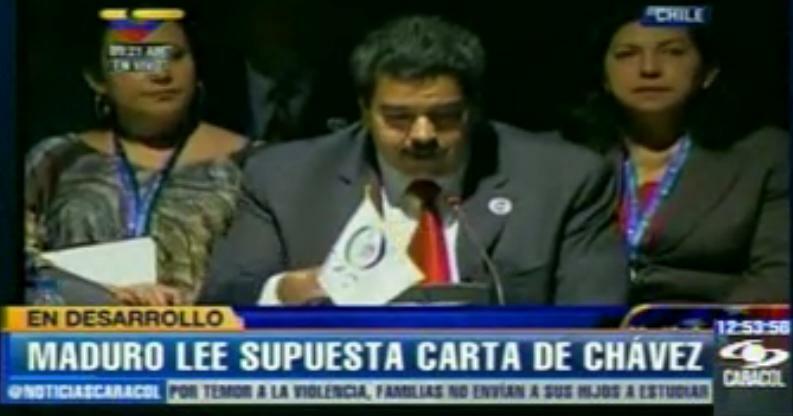 Source: screenshot of Caracol TV news channel, taken on January 28, 2013. The CELAC flag [was] the emblem on a blue horizontal background as seen here.